2018 is a year which is known for Notched display Smartphones. After the launch of iPhone X in last year, almost every smartphone company is launching notched display. Notched Display not only gives a good view to your smartphone but also decrease the size of the phone. Notched Phones are the new trend in the market as they reduce phone size without decreasing Phone’s screen size and with this phone gets a new look. In this list, we are going to be discussing the best phones to have incorporated the Notched Display design to add a wow factor to the phone. It cannot be denied that all notched smartphones look really good so anyone average consumer would find themselves in a fit over which might be the best notch smartphone under 15000 in India. Well, that is why we are here as we have prepared a thoroughly researched list of the best notch display phone under 15000 Rs in India. Read this list until the end to find the perfect device for you. How did we prepare this list of Top 5 Best Notch Phones under 15000? We always try to bring best to you so, while preparing this list we not only considering notched display but we check the whore all performance of the phone. In this list, we have checked the whole configuration about phones. The Honor 8X is having Hisilicon Kirin 710 with Octa Core 2.2 GHz Processor which makes it fastest phone under 15k, that’s why it is at top of our list. Honor 8X is having a premium look due to Dual color back glass which is very strong. The phone looks beautiful in hands and is easy to hold these points make it best-notched phone in India under 15K. Honor 8X features a brilliant 6.5 inches FHD+ IPS LCD Infinity Display with a resolution of 1080×2340 pixels that produces sharp contrast and high dynamic color for a much more immersive viewing experience. The Honor 8X is having 19.5:9 screen to body ratio. The Device has a PPI of 396 which is quite good and the display looks crisp. The device comes with different type of Eye comfort mode for their users which is great at this price. Eye comfort mode in which blue light radiation is reduced to prevent eye fatigue. The Honor 8X comes with unique Sunlight display technology which enables the display to be clearer under even the bright sunlight. There is a special Night mode for easy bedtime readers. The Honor 8X uses Hisilicon Kirin 710 with Octa Core 2.2 GHz Processor which comes with Mali G51 GPU. This duo helps Honor 8X to give the best performances. Coming to the camera, Honor 8X is having a dual rear camera set up with 20MP (f/1.8) + 2MP with Dual tone flash. Honor 8X comes with AI dual-camera captures pictures at resolutions up to 20MP. Portrait mode, Phase detection autofocus, Panorama, HDR are different modes make your photos more clear. Other features of the Honor 8X includes things like dual-band Wi-Fi b/g/n/ac, BT v5.00, 64GB of internal storage, expandable storage up to 400 GB, NFC, Face unlock, Rear mounted Fingerprint Sensor etc. For the included sensors, it comes with a proximity sensor, ambient light sensor, accelerometer, gyroscope, magnetometer, etc. 8X Comes with a powerful Li-Po 3750mAh battery which is powerful to run your device for one day easily. Heavy games like PUBG runs smoothly without any Lag problem. Honor 8X uses the old MicroUSB port, instead of the new USB-C. There is no option for fast charging so you have to sacrifice a proportion of time in refuelling the battery. Phones use Mali G54 GPU whereas other phones of this range use Adreno 5 Series which is faster than Mali g54. The built-in audio quality is not so loud and clear. So you cannot watch movies or videos without headphones or external speakers. Relatively bulky and difficult to handle. In our list of best notch display smartphone under 15000, the Realme 2 Pro is only one having the most unique type of Notched display i.e waterdrop like Notch. The Realme 2 Pro is the best phone by Oppo’s Realme Series. 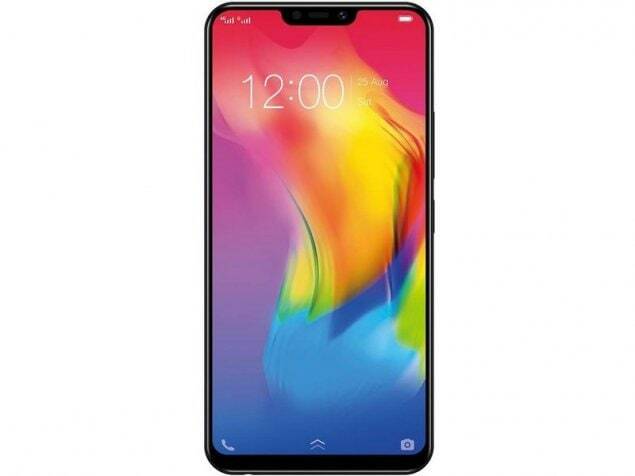 Realme is having great design and is having a glass body. This phone is having great built quality and great performance. It is great to water Dew like Notch at this Price tag. This Phone forges a 6.3-inches FHD+ IPS-LCD dewdrop notch display protected by Corning Gorilla Glass 3 and has round edges. It comes with 2340 x 1080 pixel resolution and at 409 PPI. The colors are very sharp and clear with wide viewing angle. The dewdrop notch display is the world’s first display to be introduced at this price range in any smartphone as per Realme verdict. Realme 2 Pro is powered with Qualcomm SDM660 Snapdragon 660 chipset and Octa-core (4×2.0 GHz Kyro 260 & 4×1.8GHz Kyro 260) CPU along with Adreno 512 GPU that gives a rigid backbone to the phone. The fast processor and ultimate GPU leads to high performance and great graphical interface. Games like PUBG and Modern Combat 5: Blackout without any heating issue or lag. The phone is packed with a streak of sensors that include the fingerprint (rear-mounted), accelerometer, gyro sensor, proximity sensor and a compass which work appropriately. They are fast and dedicated to functioning. The Realme 2 Pro has a plastic framework just like the Realme C1 which makes it delicate to handle and more open to damages. There is no option for fast charging so you have to sacrifice a proportion of time in refueling the battery. Realme 2Pro faces heating Issues while playing heavy games Like PUBG. Decent cameras for the price. The Honor 9N is having UFS 2.1 Storage which makes it fastest Storage phone of this segment. The Huawei Honor 9N brings to the table a lot of powerful features that include a snappy processor, beautiful design, fast storage type, and a beautiful 5.84″ Notch Display. These things make it one of the best choices in top-notch phones under 15000 that are available in India. The Honor 9N sports a 5.84″ FHD+ IPS Panel whose quality is hard to match under this price. The Display is vibrant and accurately portrays colors and scenes. The Honor 9N has the Kirin 659 with 2.36GHz octa-core (4×2.36GHz + 4×1.7GHz) processor whose performance is hard to match in day-to-day tasks. And the cherry on the cake is the GPU Turbo technology, which is a boon for gamers. This allows for lower battery drain whilst offering an increase in GPU Power. At this price, it remains unbeatable. The Hybrid SIM-Slot is becoming dated as more and more brands are incorporating that feature in their devices offering a lot of expandability. Honor 9N is having a small battery of 3000mAH which is not sufficient nowadays. Whereas you can get a more powerful battery in the same price range. Honor 9N does not come with fast charging. Which is not good for this price tag. Vivo Y83 is based on MediaTek Helio P22 with 2GHz octa-core Processor which make it to Stand different in the list of best notched phone under 15000. 13MP (f/2.2) primary camera on the rear and an 8MP front shooter for selfies. Chinese company Vivo is doing great in the Indian market with its Midrange devices. The Y83 is a smart looking Device which is powered by the MediaTek Processor. Y83 comes with a beautiful Notch and is having 64GB ROM which is Good nowadays. The camera of Vivo Y83 is performing Good. Vivo Y83 forges 6.22 inches big display which is having a resolution of 720×1520 pixels which is protected by Gorilla Glass 3. The phone comes with an aspect ratio of 19:9 with a Pixel density of 270. Vivo Y83 is having a Bright and very sharp colored display. The phone comes with a 13MP Rear camera with an aperture of f/2.2 which performance good in light or you can say in daylight. Performance of cameras is good for this price tag and you have great options for your pictures as this phone is packed with HDR. The phone is having a good battery as it is having a 3260mAh powered battery which is sufficient for day to day work. The Vivo Y83 is having Latest android which is 8.0(oreo) and we can expect an upgrade with the passage of some time. The phone comes with MediaTek Helio P22 Processor which is just fine for this price tag as you can see Qualcomm Snapdrogan in same price Tag. Performance of this processor is not up to the mark. Vivo Y83 is having a plastic body which heats up quickly. Performance has given by cameras are not good in low light or in the night. Pictures taken at night are not sharp. It comes with a custom UI skin, so it also has its own disadvantages. The phone is having best built up quality in this range. Nokia 5.1 Plus is the only phone in this range of under 15K which is based on Android One Program which means your phone is going to be updated and Secure in Long Run. The Nokia 5.1Plus jolts a powerfull built quality hardware, Normal CPU and GPU is also Normal, great cameras and attention seeking design which makes the phone special. The phone looks very good in the hand and has a great built up quality. Looks of the phone are really liked by people. The ample of space and notched display are the highlight features of the phone. Nokia 5.1 Plus forges a 5.86-inches HD+ IPS-LCD Notched display with 287pixel density and screen is protected by Corning Gorilla Glass 3 and has 2.5D cover glass edges. It comes with 1520 x 720-pixel resolution. The phone contains a 19:9 aspect ratio. The colors are very sharp and clear with wide viewing angle. The Phone is packed with 13MP (f/2.0) primary sensor +5MP depth sensor rear camera setup with LED flash. Images clicked through the rear camera are smooth and clear in daylight. The rear camera has HDR, Panorama, Beauty shot, Hybrid Zoom, Color, and Mono are great options while taking photos with rear cameras. Nokia 5.1 Plus is powered Media Tek Helio P60 Octa Core 1.8 GHz Processor chipset coupled with Mali-G72 MP3 for graphics performance which is a backbone to the phone. The processor leads to high performance and low graphical interface. So this was our list of the Top 5 Best Notch Display Phones under 15000 in India. How much do you like the post “Best Notch Display Phones to buy below Rs 15000 2018”? And Don’t forget to share the topic ‘Top 5 best notch display phones under 15000′ on social networking site because this might be helpful to other.